We just survived a 22-hour long flight journey (with one stop at London) from Boston back to Singapore. Both the Boston to London and London to Singapore flight legs were full – thus no 4-seaters or 3-seaters where we could lie down to sleep for the journey. Nonetheless, the journey (on economy class) was bearable due to a few pre-flight preparations. I will be sharing some of these pre-flight preparation tips here – do let me know if you have other tips to survive long haul flights. 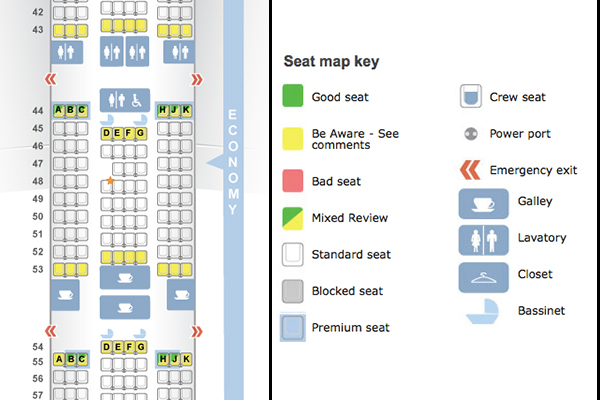 Use seat preview websites like SeatGuru.com or SeatExpert.com to see reviews of seats before you choose your seat online at the airline website. What’s cool about these sites is that they will tell you what’s a good seat and most importantly what’s a bad seat and why. Reasons for bad seats could include back row seats which are unable to recline a lot and are near the lavatory (where there will be a lot of traffic and as a result noise). Personally I prefer an aisle seat in the centre row so you will have ease of access to the lavatory (toilet) whenever you want (instead of having to wait for someone to get up to let you through to the aisle). You will also need to make way for at most one person as opposed to two persons for an aisle seat in the left or right side rows. While most airlines provide a small pillow for long haul flights, these pillows are not designed to support our neck perfectly. One of the must-have items for us is a neck pillow, which is ergonomically designed to provide neck support. Finding a perfect neck pillow involves lots of trial and error as there is no one size fits all. 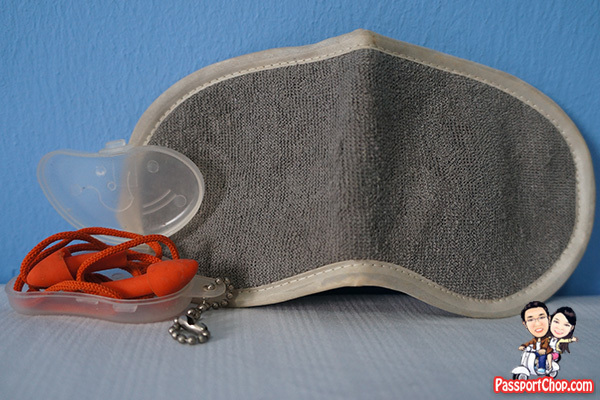 We prefer the neck cushions with micro-beads (as opposed to those inflated ones) as they are really very comfortable. 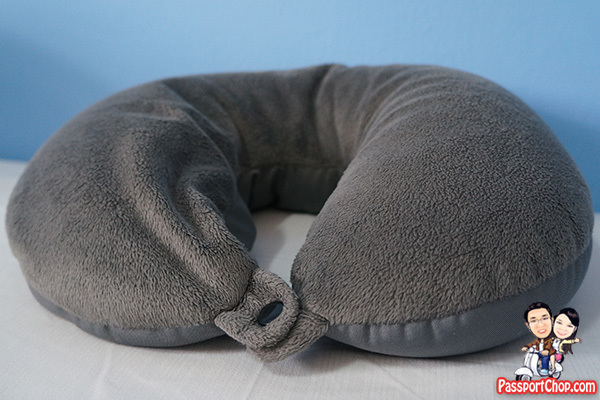 These neck cushions are much more bulkier than self-inflatable neck pillows but it is worth the effort for a good rest on a long haul flight. We never forget our eye shades (or some call it eye mask) and ear plugs for long haul flights. Eye shades are designed to keep all incoming light from the surrounding to induce a state of darkness, which will simulate our brain to produce melatonin (a chemical that when produced reminds the body to sleep) enabling us to fall into sleep faster. Earplugs are also necessary to cancel the surrounding noises produced by passengers around you. If you still can’t sleep after Tip No. 1 and 2, you can always fall back on the in-flight entertainment system. Going back to Tip No. 1, when choosing your flight, do check that the aircraft you are flying in has personal in-flight entertainment systems (not those that is played on a big screen in front of you). SeatGuru.com publishes such info – you will need to know 2 things – One: Flight number and Two: Aircraft model (e.g. 777 or A380) to find the exact match on the website. Thus, if your flight does not have personal in-flight entertainment, all the more you need to prepare to “entertain yourself” with your own devices. Laptops are too bulky and the seat table is not exactly very spacious. Books and magazines are a hassle to carry around. 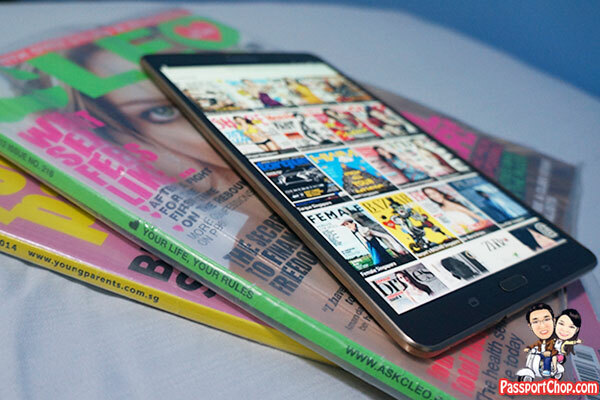 We found the perfect device for our personal in-flight entertainment system – the Samsung GALAXY Tab S which can be used for watching movies, reading e-books and e-magazines or playing games. While there are many tablets in the market, the Samsung GALAXY Tab S (8.4”) LTE is one of the thinnest (6.6mm) and lightest (298 grams). This allows for greater portability on-the-go for frequent flyers like us. With 16GB memory and a MicroSD slot which allows for up to 128GB expanded memory space, we can put in a lot of movies and TV series (especially the Hong Kong drama series which not all airlines have on their in-flight entertainment systems) and still have some space left for ebooks. 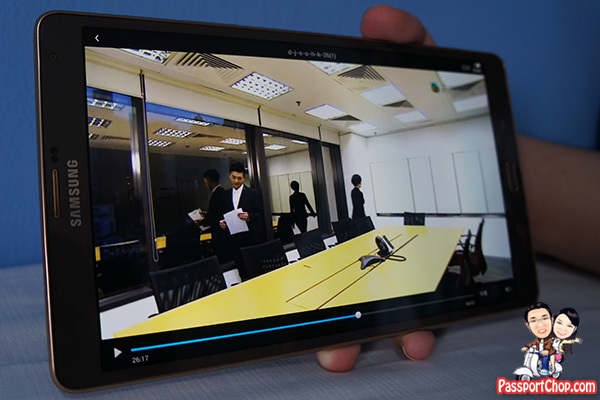 With Samsung GALAXY Tab S’s Super AMOLED Display, watching a show on it feels really shiok as the whole viewing experience is enhanced with richer colours and deeper contrast. Moreover, Samsung GALAXY Tab S’s Adaptive Display caters to suit the usage and environment, and adjusts its contrast accordingly! 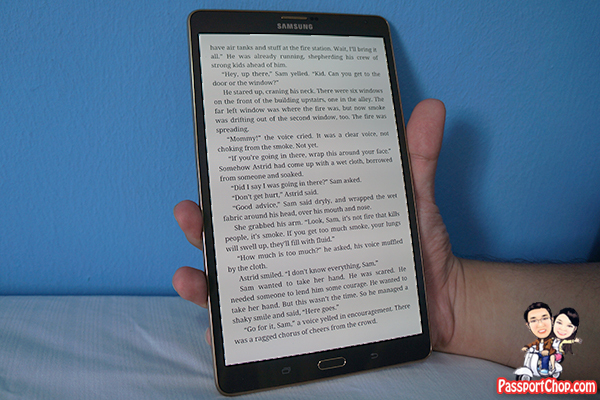 Despite these multiple usage which may seem draining, the battery life of the GALAXY Tab S can last up to 10 hours! The Samsung GALAXY Tab S also comes with exclusive premium content and services i.e. the GALAXY Gifts which allows me to enjoy 3 free issues of SPH magazines – I can download the latest digital issues of CLEO or Young Parents magazine for free and not having to lug the physical copies around during the trip. Tired of reading or watching movies, the Samsung GALAXY Gifts also include games with credits e.g. Cut the Rope 2 with free $15 customised value set or Asphalt 8 with free in-game prime car pack – no need to bother with in-app purchases: just download the app and you are already at an advantage with a better car! Drink Plenty of Water – simple as that. Instead of always having to ask the flight attendants for cups of water, bring an empty water bottle onboard and ask one of the flight attendants to fill it up for you. If you are departing from Singapore Changi Airport, even better – there are water refilling points at the waiting area just before you board the plane. 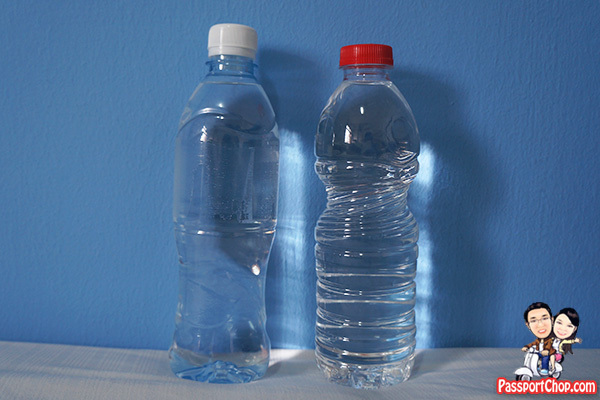 Just an additional tip – pack a sealed full bottle of water in your checked-in luggage. Sometimes, upon clearing immigration, you might be in a rush to get to your next destination and you might feel thirsty during the long drive to your hotel and there are no opportunities to buy a bottle of water or the bottled water in the hotel minibar is way too expensive (in places where the tap water is not drinkable) – so bring along your own to prevent such a situation from happening. Moisturize Your Skin and Lips – Use lip balm or a small hand moisturizer to keep your skin smooth and moisturized so you don’t feel discomfort during the flight. Move Around. To prevent your body from aching due to poor blood circulation. You can do some stretching by strolling up and down the aisle a few times to help in blood circulation and at the same time reduce fatigue. Simple leg exercise could also be done at the back of the cabin where it is more spacious. Bring along travel toothpaste (must be below 100ml) and toothbrush or mouthwash to freshen up just before your flight is due to arrive at your destination. I find that those provided by the airlines are too small or sometimes they don’t even provide such amenities.